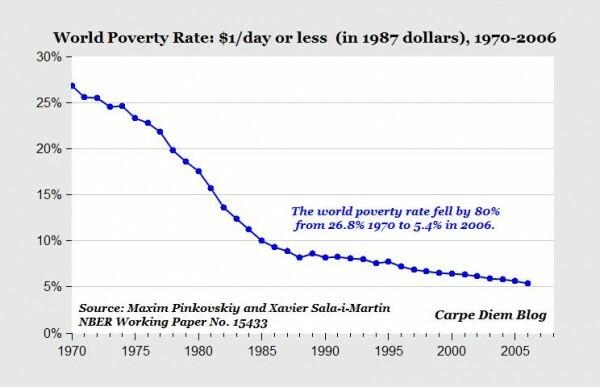 According to the American Enterprise Institutue the chart above could perhaps qualify as the “chart of the century” because it illustrates one of the most remarkable achievements in human history: the 80% reduction in world poverty in only 36 years, from 26.8% of the world’s population living on $1 or less (in 1987 dollars) in 1970 to only 5.4% in 2006. From the video: “I will state, assert and defend the statement that if you love the poor, if you are a good Samaritan, you must stand for the free enterprise system, and you must defend it, not just for ourselves but for people around the world. It is the best anti-poverty measure ever invented.